The canton of Vaud (French pronunciation: ​[vo], German: Waadt) is the third largest of the Swiss cantons by population and fourth by size. It is located in Romandy, the French-speaking western part of the country; and borders the canton of Neuchâtel to the north, the cantons of Fribourg and Bern to the east, Valais and Lake Geneva to the south, the canton of Geneva to the south-west and France (Auvergne-Rhône-Alpes and Bourgogne-Franche-Comté) to the west. The capital and biggest city is Lausanne, officially designated "Olympic Capital" by the International Olympic Committee and hosts many international sports organizations. Other main cities are Yverdon-les-Bains and Montreux. As of 2017 the canton has a population of 793,129. Along the lakes, Vaud was inhabited in prehistoric times. Later, the Celtic tribe of the Helvetii inhabited the area. The tribe was defeated by Caesar's troops in 58 BC and as a consequence the Romans settled the area. 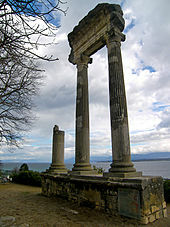 The towns of Vevey (Latin: Viviscus) and Lausanne (Lausonium or Lausonna) are two of the many towns established by the Romans. In 27 BC the state of Civitas Helvetiorum was established around the capital of Avenches (Aventicum). There are still many Roman remains around the town today. Between the 2nd and the 4th century the area was repeatedly invaded by Alemannic tribes, and in the 5th century the Burgundians occupied the area. The Merovingian Franks later replaced the Burgundians. Their occupancy did not last long either, and in 888 the area of the canton of Vaud was made part of the Carolingian Empire. In 1032 the Zähringens of Germany defeated the Burgundians. The Zähringens themselves were succeeded in 1218 by the counts of Savoy. It was only under the counts of Savoy that the area was given political unity, establishing the Barony of Vaud. A part stretching from Attalens to the River Sarine, in the north, was absorbed by the canton of Fribourg. As the power of the Savoys declined at the beginning of the 15th century the land was occupied by troops from Bern. By 1536 the area was completely annexed. Reformation was started by co-workers of John Calvin like Pierre Viret, including a famous debate at the cathedral of Lausanne; but it was only decisively implemented when Bern put its full force behind it. The Bernese occupiers were not popular amongst the population. In 1723, Major Abraham Davel led a revolt against Bern, in protest at what he saw as the denial of political rights of the French-speaking Vaudois by the German-speaking Bernese, and was subsequently beheaded. Later, inspired by the French Revolution, the Vaudois drove out the Bernese governor in 1798 and declared the Lemanic Republic. Vaud nationalists like Frédéric-César de La Harpe had called for French intervention in liberating the area and French Revolutionary troops moved in, taking over the whole of Switzerland itself in the process and setting up the Helvetic Republic. Under Napoleon I, it became the canton of Léman. Unrest about the abolition of feudal rights and taxes led to increased discontent, which culminated in the revolt of the Bourla-papey in Spring 1802, closely followed by the Stecklikrieg that brought the end of the entire Helvetic Republic. In 1803, Vaud joined the re-installed Swiss confederation. In spite of Bernese attempts to reclaim Vaud, it has remained a sovereign canton ever since. In the 19th century, the canton of Vaud was an outspoken opponent of the Sonderbund Catholic separatist movement, which led to intervention in 1847 by 99,000 Swiss Federal troops under General Henri Dufour against 79,000 separatists, in what is called the Sonderbund War. Separation was prevented at the cost of very few lives. The current constitution dates from 14 April 2003, replacing the one from 1885. 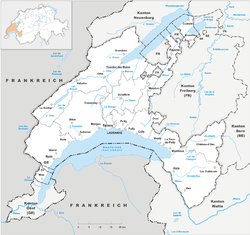 The canton stretches from Lake Neuchâtel in the north, where it borders the canton of Neuchâtel, to Lake Geneva (French: Léman) in the south, where it borders the canton of Geneva, the French department of Haute-Savoie (lake border) and the canton of Valais (Chablais). In the Jura mountains in the west, the canton borders the French departments of Ain, Jura, and Doubs. In the east, it borders the cantons of Fribourg and Bern. The total area is 3,212 square kilometres (1,240 sq mi). Along with the canton of Berne, Vaud is one of the two cantons whose territory extends from the Jura to the Alps, through the three distinct geographic regions of Switzerland. The areas in the south east are mountainous, situated on the north side of the Bernese Alps. This region is commonly named the Vaud Alps (French: Alpes Vaudoises). The Diablerets massif, peaking at 3,210 metres (10,531 ft), is the highest mountain of the canton. Other summits such as the Grand Muveran and the Tour d'Aï are visible from most of the canton. The area also hosts several popular skiing destinations such as Villars, Les Diablerets and Leysin. The central area of the canton, in contrast, consists of moraines and is hilly. There are plains along the lakes. 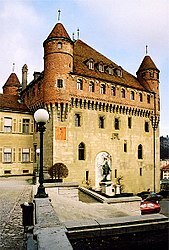 In the north, Avenches is in an exclave of the canton surrounded by the canton of Fribourg and Lake Neuchâtel. On the other hand, there are three enclaves of the canton of Fribourg (Estavayer-le-lac, Vuissens, Surpierre), as well as two enclaves of the canton of Geneva (Céligny), that are surrounded by the canton of Vaud. The north-western part of the canton is also mountainous but in a more modest way with mountains generally not above 1,500 metres (4,900 ft); the Jura Mountains. The Vallée de Joux is one of the most popular destinations in the region and also a centre of luxury mechanical Swiss watch manufacturing. The room of the Grand Council of Vaud, the parliament of the canton of Vaud. There are 376 municipalities in the canton (As of 2008[update]). The population is French-speaking and historically was mostly Protestant (Calvinist), dating from the early years of the Reformation. Recently, however, this has been changing due to immigration from Southern Europe. In 2000, the population was nearly evenly split between Protestants (40%) and Roman Catholics (34%). The population of the canton (as of 31 December 2017) was 793,129. As of 2010[update], the population included about 28% foreigners, including many Italians. The major population centres of the canton are: Lausanne (138,905 inhabitants in 31 December 2017), Montreux-Vevey (Montreux: 26574 Vevey:19827 inhabitants) and Yverdon-les-Bains (30,143 inhabitants). The region around Nyon is often considered part of the agglomeration of Geneva. All of these are on Lake Geneva (called Lac Léman in French), except for Yverdon, which is on Lake Neuchâtel. The capital, Lausanne, is the major city of the canton. There are light industries concentrated around it. In 1998, 71.7% of the workers worked in the tertiary sector and 20.8% in the secondary. The canton is the second-largest producer of wine in Switzerland. Most of the wine produced in the canton is white, and most vineyards are located on the steep shores of Lake Geneva such as the UNESCO World Heritage Site the Lavaux Vineyard Terraces. There is agriculture in the areas away from Lake Geneva. Sugar beet is important around Orbe, tobacco in La Broye Valley and fruit is grown on the foot of the Jura mountains. Cattle breeding and pasture are common in the Alps and the Jura mountains. There is a salt mine at Bex. Tourism is important in many towns along the Lake Geneva. Major lakeside resorts include Lausanne, Montreux and Vevey. The Union Cycliste Internationale is based in Aigle and many of its defamation lawsuits against critics have been heard in the Est Vaudois district court of Vevey. Taillé aux greubons are a salted bakery specialty of the region consisting of crackling encased in puff pastry. Carac is also one of the canton's specialty: it is a pastry made out of crust filled with chocolate and toped by a characteristic green frangipane layer, with a dot of brown chocolate in the middle. ^ "Le français est la «langue officielle» du canton de Vaud..." Retrieved 2016-08-08. ^ "Canton de Vaud (Confédération suisse)". Retrieved 2016-08-08. ^ "Article 3 : Langue officielle". Retrieved 2016-08-08. ^ "Lausanne Olympic Capital". 2012. Retrieved 2012-12-17. ^ Histoire de la Suisse, Éditions Fragnière, Fribourg, Switzerland. ^ "Les 10 ans de la constitution: Canton de Vaud : site officiel". Vd.ch. Retrieved 2014-05-03. ^ The Swiss Parliament. "Members of the National Council: Canton of Vaud". Retrieved 2017-04-06. ^ The Swiss Parliament. "Members of the Council of States: Canton of Vaud". Retrieved 2017-04-06. ^ Nationalratswahlen: Stärke der Parteien nach Kantonen (Schweiz = 100%) (Report). Swiss Federal Statistical Office. 2015. Archived from the original on 2016-08-02. Retrieved 2016-08-08. ^ Canton de Vaud (2010). "International website for the promotion of the canton of Vaud - Population and social life". Retrieved May 23, 2010. (in French) Laurent Flutsch and Séverine André (with the collaboration of Bernadette Gross), Y en a point comme nous. Un portrait des Vaudois aujourd'hui [There are none like us. A portrait of the Vaudois of today], Éditions Infolio, 2015, 368 pages (ISBN 9782884747615). Wikimedia Commons has media related to Canton of Vaud.